When you’re an artist just starting out, and you can’t afford supplies… what do you do? Yep, just pick them up off the ground! That’s how Pittsburgh based artist Seth Clark got started on his absolutely mind-blowing collages. I wrote about him way back in 2011 and now, in 2018, I finally got to ask him all of my questions! Where does he get all of this stuff, is his studio like an episode of Hoarders, did he build awesome (while incredibly unsafe) tree houses when he was a kid? I got answers for everything! Listen right up there under that gorgeous / derelict collage, or you can subscribe on iTunes. First up, a bunch of Seth’s collages. Yes, collages… what!? Bits and pieces of all sorts of things from paper to actual shingles … LOVE. Yeah. Now THAT is a hive! Stunning. Perhaps one of the most amazing collaborations I’ve ever seen! They truly figured out how to blend their artistic skills and talents to create something beautiful. I hope they get the chance to keep working together … LARGE SCALE. ‘On the brink’, indeed. I don’t fully believe him when he says he’s not very handy, but anyway. Ok, yes… this is crazy. I don’t care, I still want to poke around in there for an afternoon just to see what I could find on the floor! 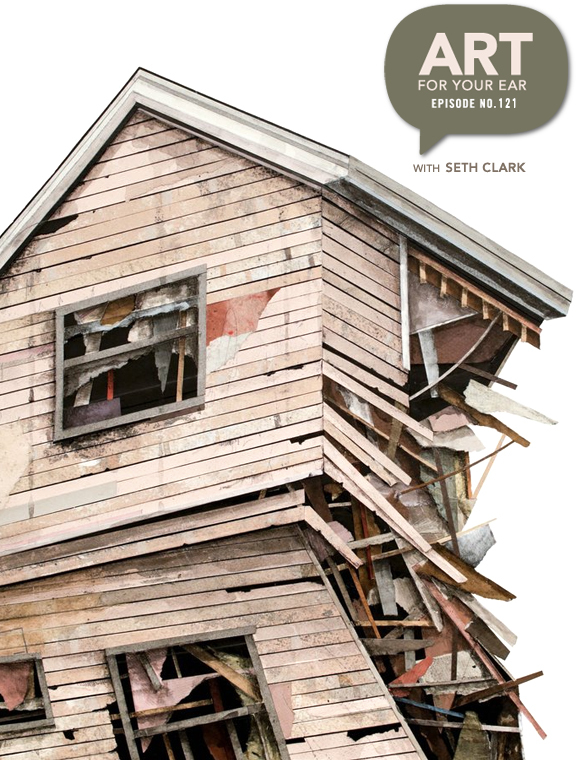 Given that Seth has so many things coming up (links to all below), I’m so thankful that he took a bit of time out to do the podcast; thanks to Saatchi Art for supporting the episode; and big thanks to you for listening! There will be more art for your ear next weekend. i really loved this conversation and he is work. sometimes, i see the artist’s work (the ones you talk to), and think, “damn, why am i not doing this?” seth’s work resonated w/ me because it remind me of stuff i used to do when i was very young… keep up the great podcasts! My son and Seth are very good friends. I live in Pittsburgh and have followed his art for quite a while. I bellieve he is an amazing artist, with such a unique perspective and talent. Thanks for your profile.